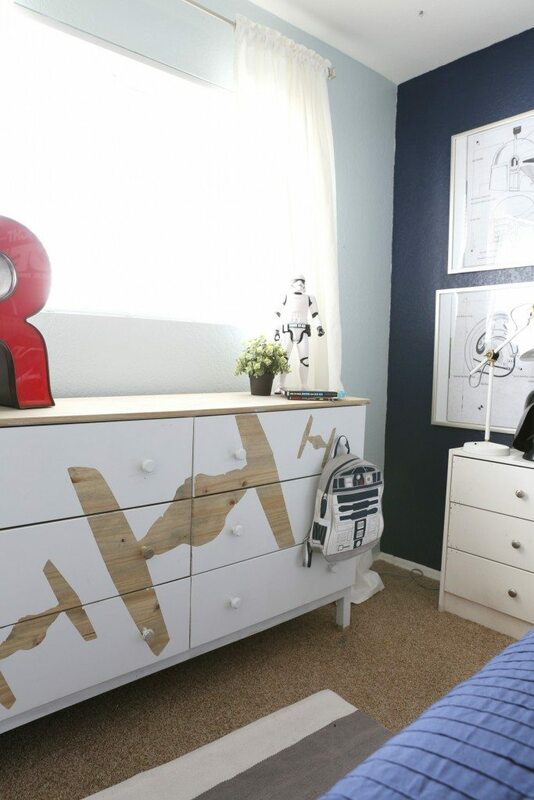 This Star Wars Kids Bedroom reveal is sponsored by American Furniture Warehouse but all the opinions are my own. You guys!!! 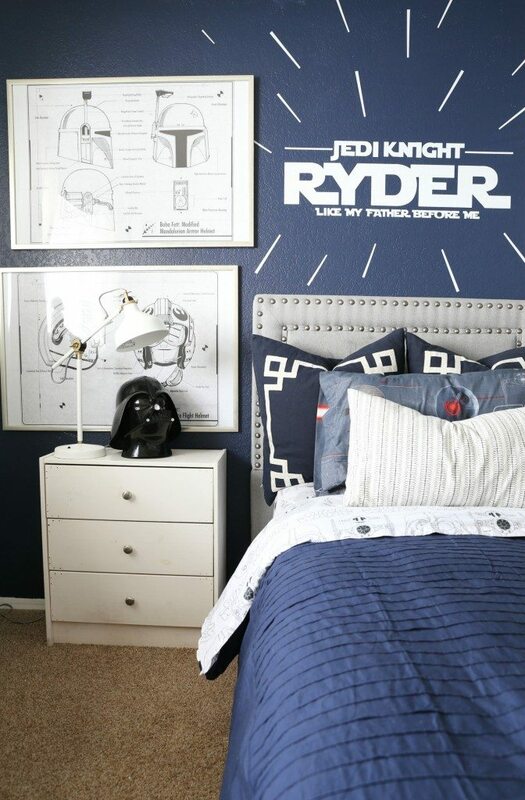 I am so excited to share my little boys room with you today. To say that he is obsessed with his new room is a bit of an understand. My three-year old little boy Ryder LOVES Star Wars. I wanted to give him a themed room with out it being to “cheesy” and I really think that Mallory and myself nailed it. The first thing that I bought for his new big boy room was his headboard. 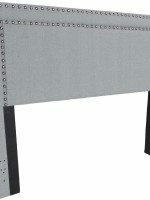 I wanted the headboard to be classy and timeless and when I found this headboard from American Furniture Warehouse I knew it was perfect. What I love about the headboard is that it totally gives the room a very rich and sophisticated feel to the room, especially with a themed room that was really important to me. I LOVE American Furniture Warehouse. I am lucky enough to have one about 20 mins from my house and whenever I am looking for a new piece of furniture I go there first! They have so much stuff and they have the most amazing prices. 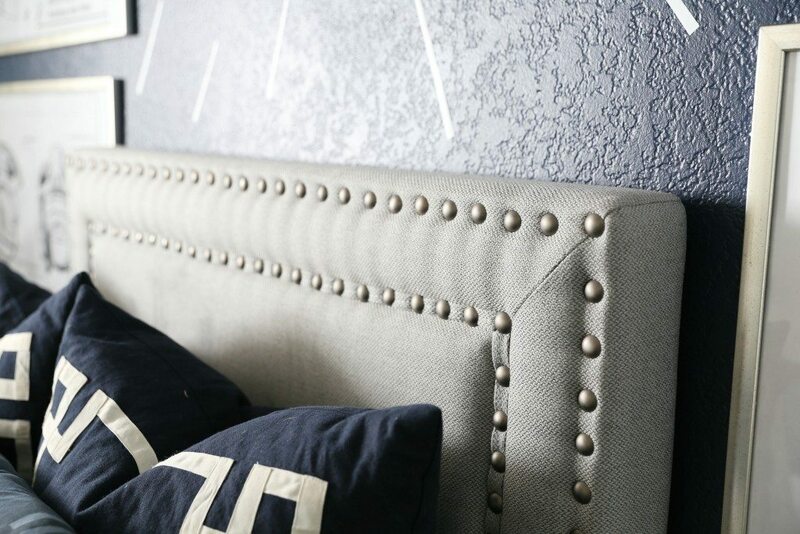 I am seriously in love with this headboard. It is everything that I was looking for and can you even believe that it was only $118!!! That is like unheard of right?!?!?!? 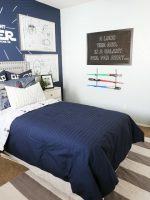 You can find the headboard HERE and check out the other awesome stuff they have. 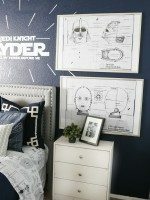 The next thing in the room that I did was paint the wall navy and I used the same navy color that Mallory used in her Master Bedroom and my kitchen island. The navy color is Sherwin Williams Naval. We wanted the navy wall to be our focal wall. I am obsessed with the prints I did! These prints are 24×36 inches so they are a whopping 2 feet by 3 feet and I got the frames from Michaels. 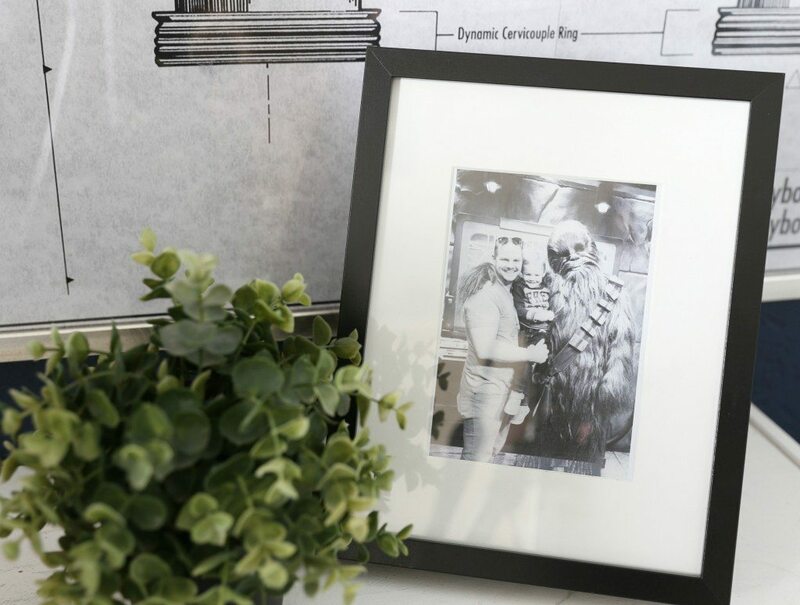 You can find the Star Wars blueprint prints in my Etsy shop Classy Clutter Print Co. Ps I will seriously love you forever and ever if you would my favorite my shop. Its brand new and I am so excited to have it up and running. It has been one of the things that I have wanted to do forever and I am thrilled that I have it. 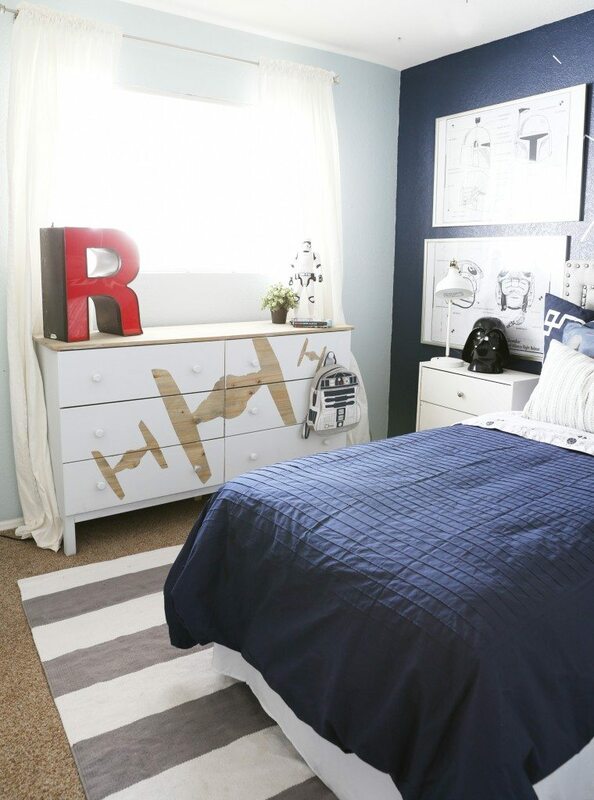 Next was this awesome custom Vinyl decal that Mallory created and it made all the difference in this room. 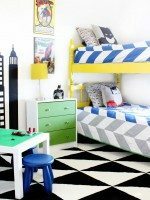 It gave the room that personally touch that is nice in a kid’s bedroom. You can buy a custom decal from her at her shop Classy Clutter Designs on Etsy here. 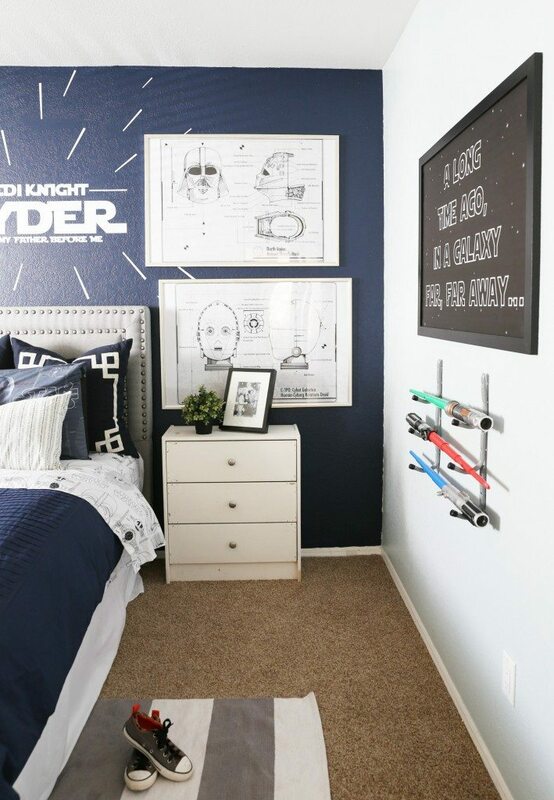 She also has some other awesome decal including decals for a superhero room that is seriously the best ever and also some of the cutest stuff for every room in your house. Be sure to head over to her Etsy shop and give her some love. 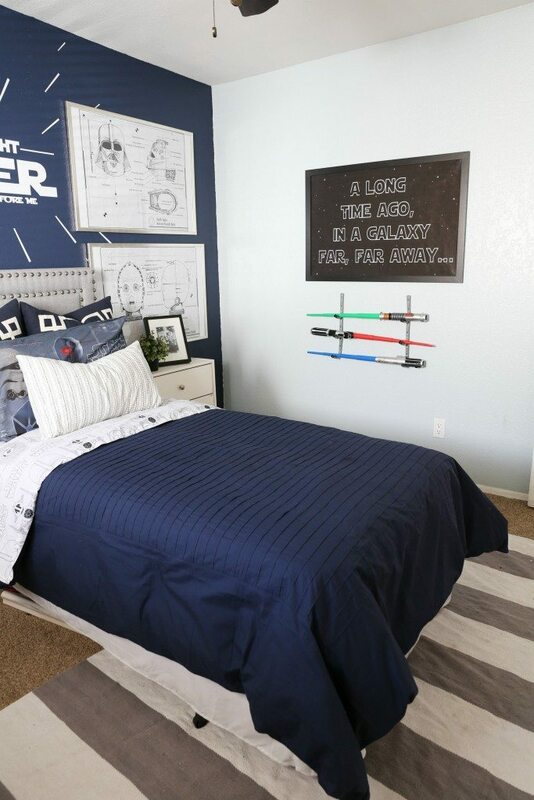 Now with the other side of the room, what Star Wars room would be complete without a place to store light sabers?!?!?!? Using some garage hooks that I found at the Home Depot for about $1.50 per hook I just nailed them to wall one above the other and it became the perfect spot for my little guy to keep his favorite toys ever and they are displayed perfectly. 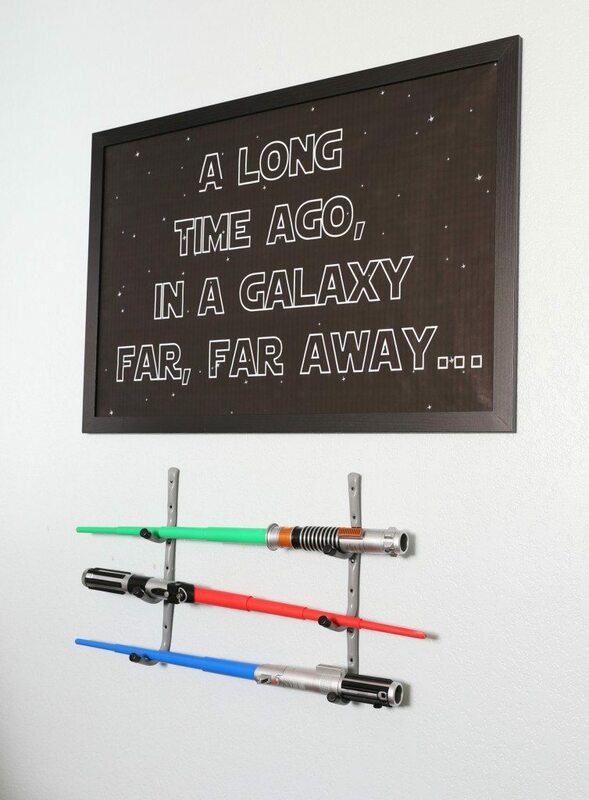 I created this ” A long time ago…” print because it is such big part of Star Wars. You can purchase this print HERE. If you like all the prints that you see in the room you can purchase a bundle pack here for a bit cheaper than just buy one print at a time. I searched high and low looking for a cool set of sheets to use in his room. 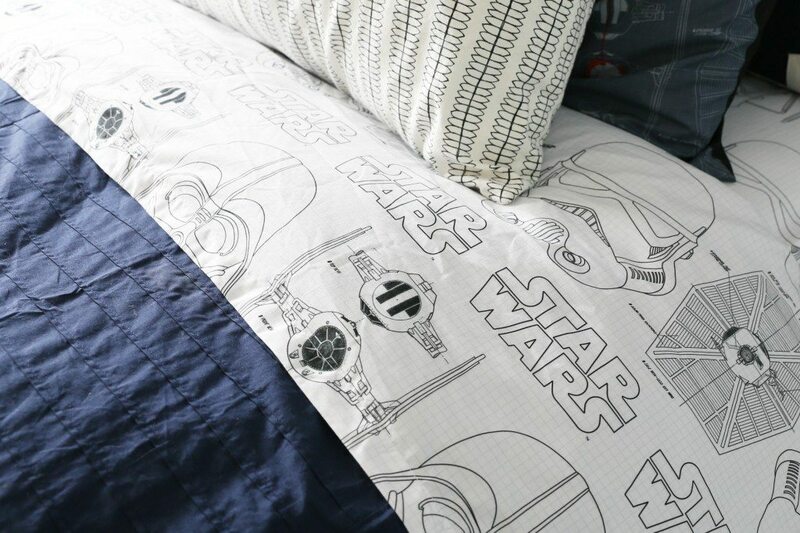 My friend Lisa was in process of doing her little boys in a Star Wars theme and found these sheets on Amazon and they are perfect! No joke they are some of the softest sheets EVER. I got the navy duvet cover at Ikea and it was a great deal and has great texture. The Dresser under the window just seals the deal and completes the whole room. Next week I will share this awesome Diy Project! This is such an easy diy and it only took me and Mallory like 30 minutes to do. This diy project has endless possibilities. 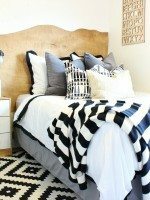 The cute grey and white striped rug is from Rugs Usa. 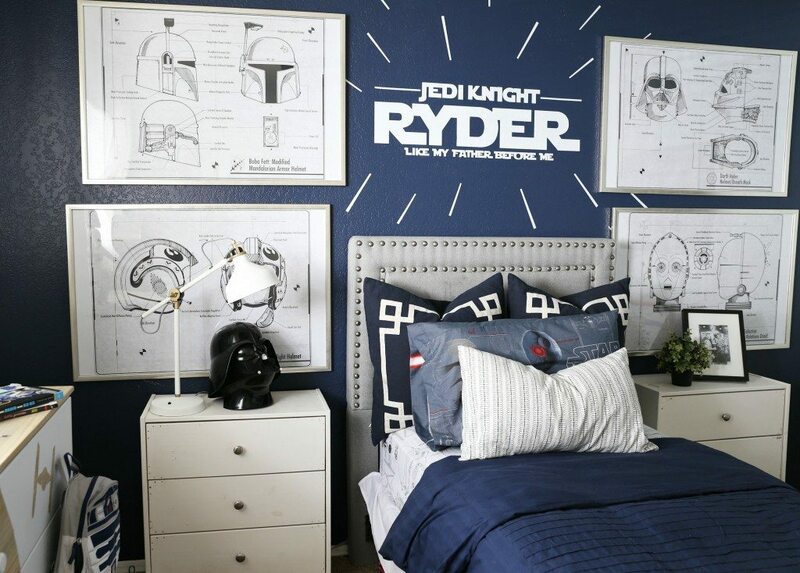 The R2-D2 backpack was a gift from my sister to Ryder and it is from Pottery Barn. 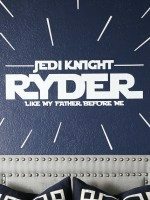 The best thing about this backpack is that it even speaks droid. One of the best things about this room is how happy is makes my little boy. He is really loves Star Wars! My husband is also a big fan! When he saw the room he said, ” Man, if I was single I would totally have a room like this.” hahaha I mean the fact that he said that was to funny especially because he is 6′ 4″ big guy and he is a bit of a tough guy for sure. We went to Disneyland for Ryder’s third birthday and we got this picture of the two of them with Chewy and I don’t know who was happier about it. 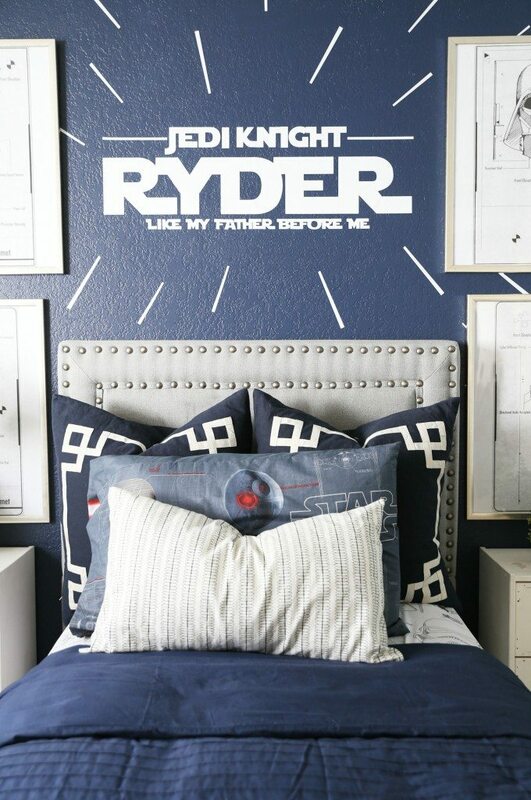 Now, it sits on his nightstand and Ryder talks about it every single night when we put him to bed. 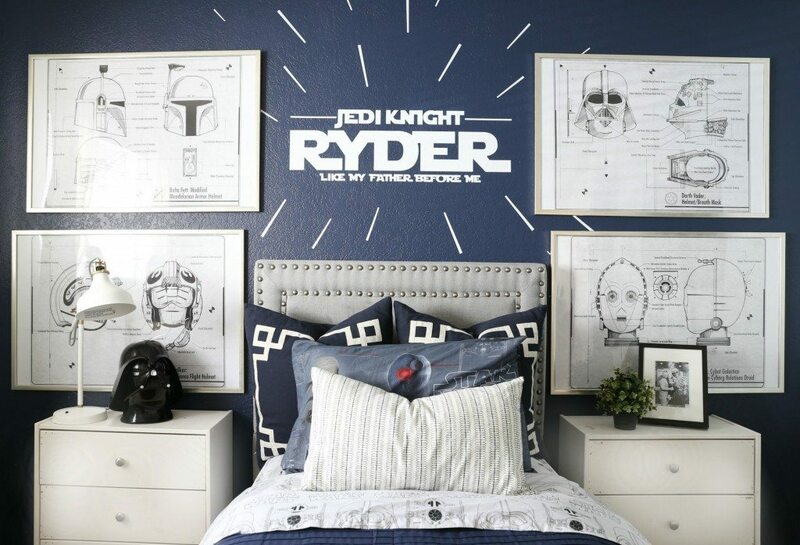 I am thrilled with how the room turned out and I am so happy that the first thing that Ryder says to anyone that walk into our house is, “Come and see my Star Wars room!” Hope you love the room and be sure to check out Classy Clutter Print Co and Classy Clutter Designs on Etsy. You girls completely nailed it. I had to show my whole family and they absolutely love the room. We are local too, so thanks for the AW info, we’ll have to check out their beds as my youngest needs a new one. This whole room is incredible! If/when we have a little boy, I picture it would be something exactly like this if I leave it up to my husband. Love all the details! Great job! This bedroom is AMAZING! My son (in kindergarten) is totally obsessed with everything Star Wars, to the point at which he and his 3.5yo sister hum the Darth Vader music every night at dinnertime. 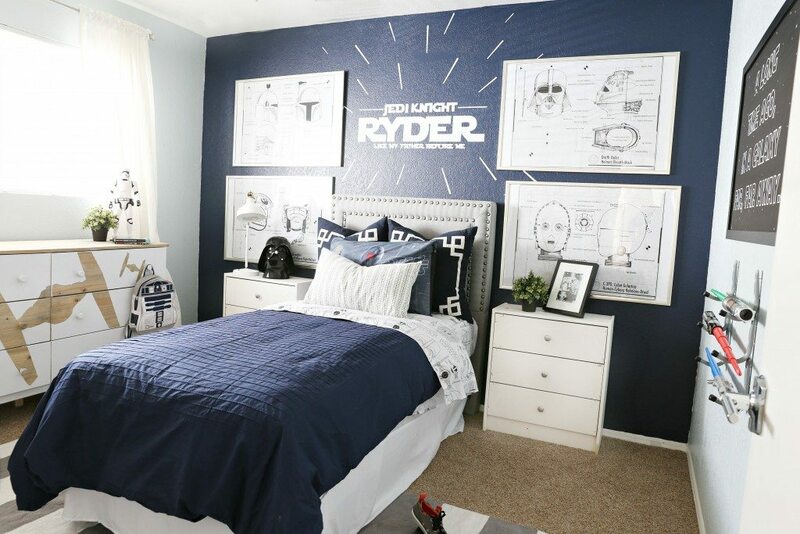 I’m afraid to show him these pictures because he’ll want me to redesign his room! Hey can this item be shipped to India ? and can i pay through PayPal ? as its in $. This is such nice article for my baby ..she is now 6 months old but having bedroom like this. she would be really happy and excited. I would turn up her bedroom into this soon. Thanks. Why can’t I see the article anymore? Looking for links. We will look into it thanks for letting us know! what color is the other walls? I think she said naval by sherwin williams. This room is so cool! My son is 9 and he loves the look. I am going to try my best to make it happen… He has a queen size bed. Do you think it would wok? I can find a gray headboard. Also I have Pottery Barn Kids’ Cameron Wall System in Tuscan, a dark wood color. Do you think I can put it on the wall opposite to the bed? Thank you so much for putting this amazing design together! Uuuhhh and I forgot to ask just now, there are two big navy pillows on the bed. Where do you think I may be able to find those?